A small boutique winery producing Pinot Noir and Pinot Gris from the Willamette Valley and Syrah from the Rogue Valley. Sensible prices and sold only direct to consumers and placed in fine resorts and restaurants. 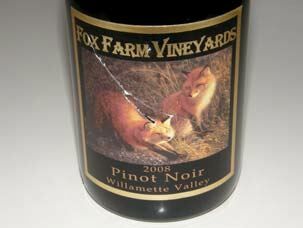 Fox Farm Vineyards was founded by Thomas Ratcliff who is close to obtaining his Master Sommelier certification and David Fish who is managing the winery's tasting room and wine bar in downtown Newberg, Oregon. Veteran Joe Dobbes handles the winemaking. The first Pinot Noir was released from the 2006 vintage. Join the mailing list online.